We somehow managed to get her near Santa, but no, she was not going to sit on his lap. Instead, we compromised and let her sit on my lap. Yes, this is the same Santa from the first year. Yeah, I so didn't plan on being in the photo, but 'eh, you make do. So I guess this is technically the first photo of Santa with Tesla too. 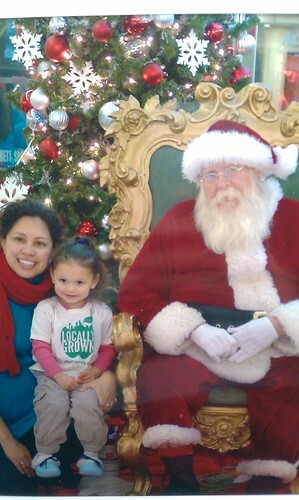 And we have 3 holiday outfits for Mari, none of which she wanted to wear because that meant a photo with Santa. Smart one, that little gal. Instead, this is what she wore for the day when we went to the mall right quick. Love those Santa photos!